How splendid - and such variety! I'm not quite sure what to do about these in Standard. They are basically the same spec trains but the HEx units have very low seating capacity (lots of first class airport express) while the 333s have very high capacity. Experimental can have two comfort setting types. I think I'll just ditch the 332s for Standard as that sort of service is just not represented. Yes, that seems sensible; there's less call for variety in Standard in many instances. Incidentally, on the subject of modern vehicles, there are some modern freight locomotives that need to be added, I believe. How delightful! I remember a friend of mine expressing amazement at travelling on one of these a few years ago, although I have not had the pleasure myself. Have you ever been on one? Looks very nice boys, a job well done! 68, yes, but wasn't the 88 a planned but never built freight version of the 87? I was thinking more of the 70. This is a different locomotive, as that TOPS number has been re-used. It's basically a dual-mode version of the Class 68 in use with DRS, and the operator of this new Class 88 is... DRS! Modelling the 88 should be easy, as it shares many components with its diesel powered stablemate. I do agree with you there, the Class 70 would be a good addition to Simutrans as a modern vehicle-plenty of oomph, and very modern. Would be cool to see a dual power locomotive in Simutrans (i.e. Class 73, Class 88), but I guess the coding doesn't support the actual use of that feature. First, it must be able to simulate engine fires! We could probably do with more variety of goods rolling stock but I don't really have much knowledge about that. I'll keep producing locos and pax trains for now but if anyone wants any particular wagons filling in, let me know (with a picture or info link). 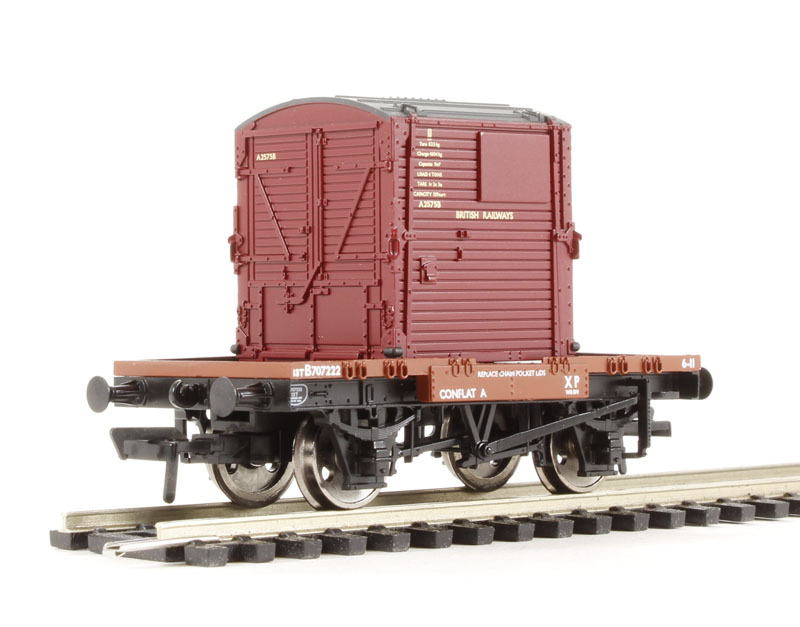 Maybe one of those early BR flat wagons for those small 2x2 m containers? Have only just noticed these latest additions - we'd been needing a 70 for a while. Splendid! We could do with a systematic review of freight wagons at some point, as some data suggest that the current system of having one set of wagons at any given era is not correct and that there would have been different sizes of the same types of wagons (especially in the pre-nationalisation era) built at the same time. It would certainly be nice to see the new Eurostar 374s in Simutrans. They are not released yet. Are there any plans to upload the sources for the work so far on these? They are rather splendid. They are indeed in need of being added to the source. It's been for ever. Yes it has been a while. There are a few more I want to do and I'd hoped I'd have finished it by now but obviously not! Will see either about finishing the project off or at least uploading what is already done in the next few weeks. It's been a while but here are some more. Class 68 In DRS and Chiltern livery and class 88 electric version in DRS (details guessed slightly as this hasn't been built yet!). Class 88 is coded as electric even though in real life it is dual mode. Some consideration will have to be given to adding dual mode vehicles into the code; this was considered a few years ago, but rejected on the ground that it would be a lot of work for a few rather obscure classes of locomotive such as the 72. The emergence of a new generation of dual mode vehicles gives rise to the need to reconsider this. Experimental has something of a backlog, but I wonder whether Keiron would consider adding this feature to Standard? Splendid! That's quite a thing. There'll still be discussions over whether it is just over complicating things I think. I've got a bit to much to think about with over things I want to get into Standard at the moment, but I'd certainly give it a go at some point. Another thought Kieron - do you have the Javelin blend files? I don't seem to have them, and it would be good to redo them in the livery they actually turned up in as well as using for a base for the visually similar new IEP trains. If not looks like I'll have to make a new blend from scratch. I remember that the 502 and 303 were missing, but maybe you fixed those before? Great thanks - will see when I get time to work on these. In reality both 800s and 801s will be operating on Great Western and East Coast, so should be livery variants in Experimental. Splendid! What are the differences between 800s and 801s? 800s are bi-mode, 801s are electric. I can't find much hard data on weight and power, other than each diesel engine is rated at 700kW on the bi-mode version. 800s can be converted later into 801s (upgrade in simutrans) by stripping out the diesel engines. There is also going to be a further order of higher-powered bi-modes for the Cornwall line, but these haven't been allocated a TOPS code and I'm not sure it's worth adding them (same graphics as 800 anyhow). Interesting - thank you. It will be useful to look into proper bi-mode operation at some point, but there is rather along queue at present. It's worth noting that both 800's and 801's are technically bi-modes, it's all down to how many of the carriages have diesel engines. On the 800's that's most of them, on the 801 only a couple have them so they can only use diesel power for emergencies. As a result they can probably just be coded as the same class, just with the option of diesel or electric carriages which can all be coupled together. Thanks for all the hard work on this pak set and also the experimental pak set as well!